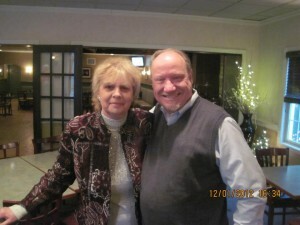 Interesting story to Dan’s painting “The Maggie P, Old Saybrook”. The “Maggie P”started out its’ life as a tugboat, and ended up in its current location in the late 1800’s or early 1900’s-in Fenwick, Connecticut. The river steamboat captains used this place as an early version of a “man-cave.” And the story goes that it was also used as a special place that housed ladies. Eventually, years later, it ended up as a cute, tiny cottage here on Long Island Sound. It is a landmark of sorts for local residents. Apparently, you can see this cottage from the 4th hole of the public golf course in Fenwick, part of Old Saybrook. 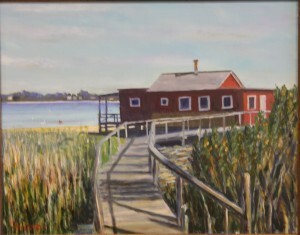 Dan has always been intrigued by this interesting home, and his inspiration to create a painting came from the famous painting “Motif No 1, and the subject for this painting is the dark, red shack located on a Bearskin Neck Wharf in Rockport, MA. So many artists from around the world have used this red shack as their subject. The day that Dan went down to “the Maggie P” to photograph, was a beautiful, brilliant day-it had a very tropical look to it. And the swans floating around near the house created a look and feel of peace and serenity. The scene was screaming to be painted. To begin with Dan blocked out the shapes on the canvas by using a palette knife and then utilized a brush to do the final steps-originally there was a heavy outlay of paint giving it depth. Many of his paintings are started out with the palette knife-you can lay down paint very quickly with the knife. And then brushes are used for the fine tuning, so to speak. Dan did make some small changes to “The Maggie P”…second picture of the painting is posted. 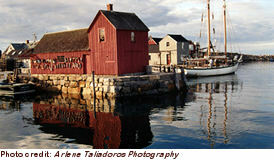 I am sure that one day, we will head up to Rockport, MA so that Dan can paint that red shack, and create his own Motif No 1. 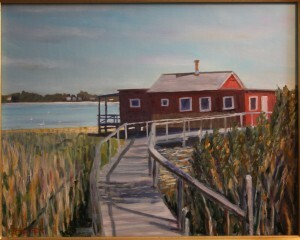 “The Maggie P, Old Saybrook” is on display and for sale at Fresh Ayer Gallery, Halls Rd, Old Lyme, CT. Great shop and gallery. Stop in and check it out.